The 6,000 square-foot Verbena will open in Hato Rey this month. 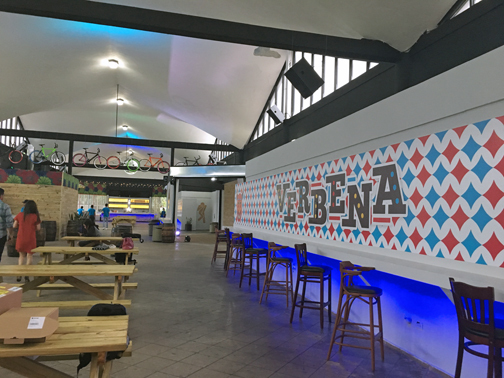 Following the worldwide trend of multi-spaces where there is food, drink and entertainment, Verbena — a new business in that category — will open this month at the Trocadero Diverplex in Hato Rey. Located across from the José Miguel Agrelot Coliseum, the space has approximately 6,000 square feet, seven gastronomic stalls, and four bars — two of them movable — in a cool, terrace-like atmosphere, overlooking the jetty. Aside from moving into an unused space at the complex — behind where the former Downtown restaurant used to be — the opening of Verbena represents the creation of 60 new jobs. The place, whose setting uses bright colors and attractive elements, such as the “vejigante” — a typical symbol of Puerto Rican culture — that appears in the logo, accomodates more than 650 people. Verbena will host events before and after events at the Coliseum, offering happy hours and other activities, company executives said. “The tendency to eat small portions at different kiosks is here to stay and evolve,” said Margarita Crespo, manager of Verbena, and spokeswoman for Barrio Latino Inc., concept developer. “Verbena is born as a new space to get together with friends, before a great concert, or simply as an excuse to try new gastronomic creations in the form of tapas, without the protocol and the cost of a restaurant, all outdoors,” she said. At Verbena, clients will find a varied gastronomic offer, from Peruvian food to a variety of sushi with a Caribbean twist. Hey Buddy!, I found this information for you: "Verbena to open at the Trocadero Diverplex in Hato Rey". Here is the website link: https://newsismybusiness.com/verbena-trocadero-diverplex/. Thank you.